I think that sums it up extremely well considering the last couple of updates have dramatically changed the way we use Alfred. The recent addition of extensions was certainly a game changer in my opinion. Now lets take a closer look at this version and see what it has to offer. The greatest improvement in this release definitely comes in the form of the newly added Powerpack Global Hotkeys tab in Alfred’s settings. Global hotkeys are keyboard shortcuts assigned to files or actions that can be executed system-wide regardless of the current program being used. The layout for the new hotkey feature is similar to that of the Extensions tab with its dual pane layout. You will find hotkeys organized in to five categories on the left and when you select one it’s settings will be available on the right. Hotkeys have an almost infinite number uses so I am only going to touch base on some of the key features that were recently added and how I have been using them. 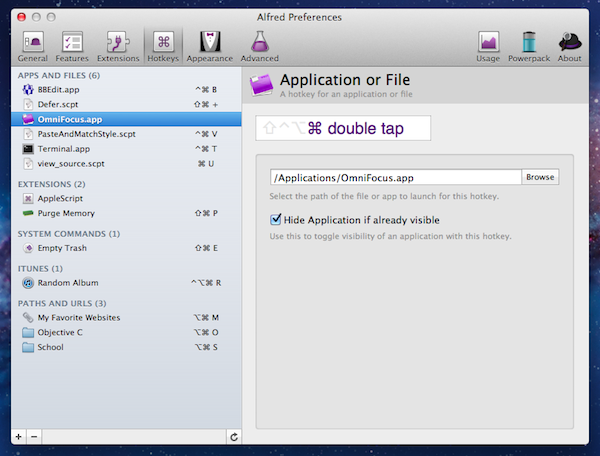 The first available option when creating a new hotkey is called “Apps or Files”. It allows you to bind a keyboard shortcut to any file or application on your Mac. I have quite a few hotkeys in this category that I find useful. For starters, since I always have OmniFocus running, I chose to bind that application to the global hotkey of “⌘ Double Tap”. Simply double tapping the ⌘ key will either show or hide OmniFocus instantly. Other “Apps and Files” hotkeys include keyboard shortcuts to the Terminal and BBEdit as well as frequently used AppleScripts. The next type of hotkey is the Extensions category. This is probably the most powerful hotkey since you can basically script an extension to do anything you want and then assign it a global hotkey to quickly call it without even having to bring up Alfred. You can even pass an argument to your extension if an argument is needed. One extension I am using a hotkey for is the Purge extension I made for quickly freeing up system memory. It is basically a shell script that calls the purge command. I find it handy to be able to call this extension with a keyboard shortcut after closing a resource intensive program like Xcode. 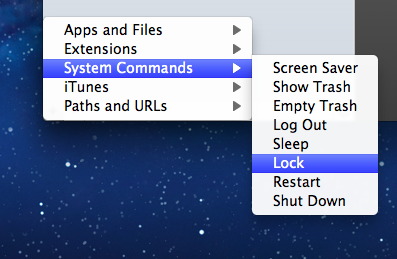 System commands are also available as configurable keyboard shortcuts. For example you can assign a global hotkey to empty your trash or lock your computer. I have tried using these but I have trouble breaking the habit of simply pulling up Alfred and just typing Empty or Lock. I have done it so many times that I feel it is just as fast as a keyboard shortcut. One hotkey I haven’t personally found a use for but others might enjoy is Alfred’s ability to control iTunes playback with global hotkeys. 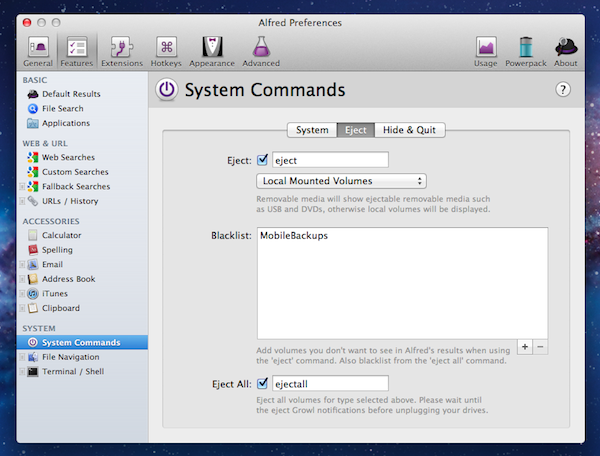 Powerpack users have always been able to issue iTunes commands from Alfred’s main window but now that step can be skipped and users can configure custom keyboard commands for these tasks. Which brings us to the last type of global hotkeys - “Paths and URLs”. This my favorite category of hotkeys because it is the group that has saved me the most time. Having a shortcut directly to a folder on my computer is extremely helpful. While working on a project I tend to access the same directories over and over. Hotkeys allow me to quickly access those directories with a single keystroke in either Finder or Alfred’s Finder navigation window. I find myself using Alfred’s navigation window more because not only do I have access to the files in that folder but also the Alfred actions I have installed. Also in this category is the ability to hotkey a URL or a group of URLs. You are not limited to only website URLs. 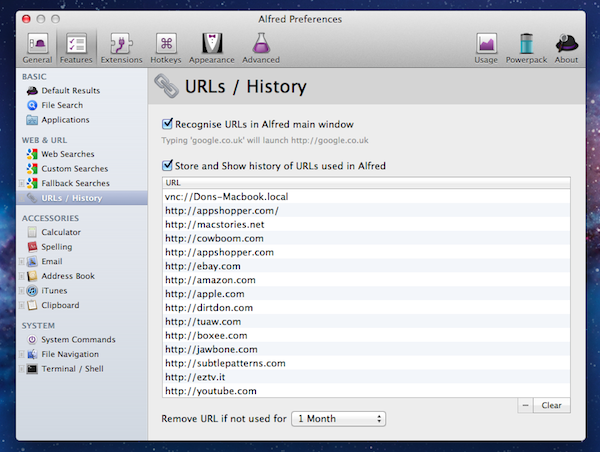 In fact, Alfred 1.0 has improved URL handling and recognition for custom prefixes. 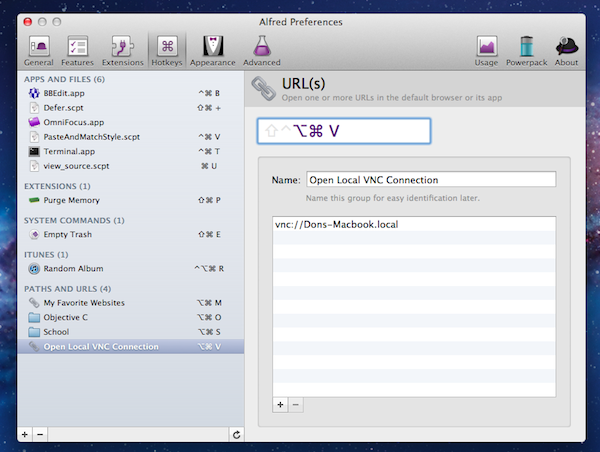 For example, I made a URL hotkey for quickly opening a VNC connection to another Mac on my local network with the vnc:// prefix. As you can see, Alfred now supports .local bonjour addresses as well. The same principle could be applied if you wanted to connect to a drive on your Airport router except you would use the afp:// prefix. Connecting to a Windows network share with a hotkey would be similar but require an smb:// address. The list goes on and on and you begin to realize how useful global hotkeys are at saving valuable time. They also have the added bonus of being synced between your Macs so you only need to configure them once. Global hotkeys are not the only new and improved features in version 1.0. You will also find a new Powerpack feature that acts as a URL history for addresses you have typed in to the Alfred search window. These URLs can be found under Features > Web & URL > URLs & History. Of all the new features added I feel this one will probably save you the most time especially if you use Alfred for launching websites regularly. After only a day or two of accessing my favorite sites, Alfred had remembered them all and I was opening webpages with only two or three keystrokes. It seems so natural now and I am not sure how I ever lived without this great feature. 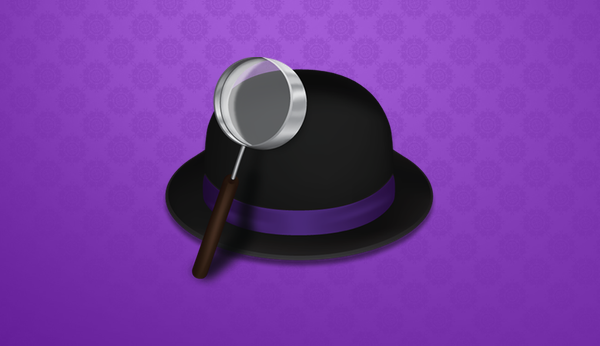 Other smaller enhancements to Alfred include being able to use ⌘+C to copy information about the current search result. I use Alfred quite a bit for locating files and copying file paths so this was an unexpected but welcomed surprise. An Eject All option was added to the System Commands feature which replaced a flakey script-based extension I whipped up for that very purpose. The Eject All feature also has a blacklist where you can add volumes you want Alfred to ignore when ejecting drives. For example, since I work off of a MacBook Air I blacklisted the MobileBackups volume used by Mobile Time Machine. The last feature I wanted to mention was the addition of optional parameters to extensions. In previous versions of Alfred if you wrote an extension that called for an input somewhere in the script then you always had to have an input parameter. Now that is no longer the case and you have the option to set the input as optional or to just have Alfred auto-detect for an input. This should make for more interesting and flexible extensions. Lets say for example you wrote an extension that needed a URL as an input. In previous versions of Alfred, that URL would either be required as an input when the extension was called or you would have to get the URL through some other method but you could not use both. Now you can set that parameter as optional and if the extension is called and not passed a URL, you could make the extension check the clipboard instead – if no URL is found you could perhaps have it grab the URL from the active tab in Safari or Chrome. 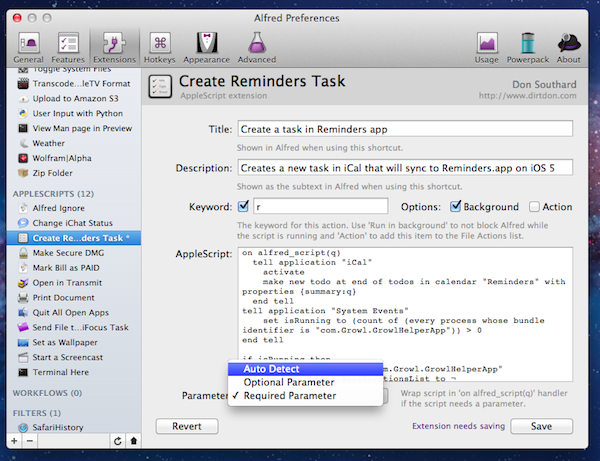 This is a great advancement in the already solid implementation of extensions for Alfred. These are only the highlights of this release and you can find a complete list of tweaks and improvements to version 1.0 in the changelog on the Alfred website. If you have already purchased a Powerpack license then you should have received a new 1.0 license in your email. This license is a requirement if you want to use the Powerpack features. If you have not already purchased a Powerpack license for Alfred I highly encourage you to do so now. The price is currently discounted to £12 or about $19 USD for a single user license. This deal will only be around for another week and then it goes up to £15 or about $24 -- which is still a great deal for such a powerful program.